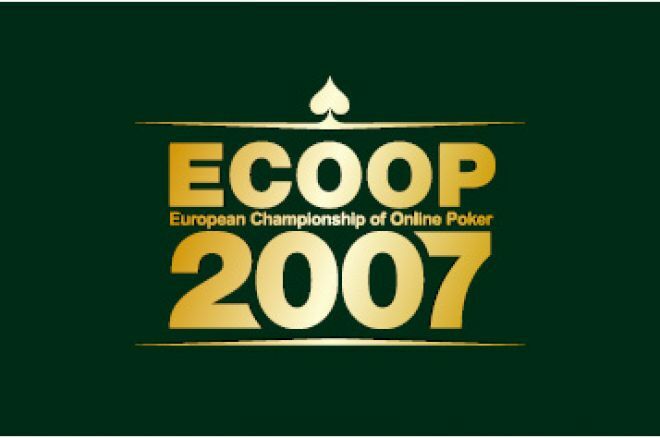 Event #4 of the European Championship of Online Poker (ECOOP) saw 672 players come together to battle it out for the ECOOP bracelet in the $100 + $9 Pot Limit Omaha with Rebuys event. The prize pool once again exceeded the guarantee, reaching a whopping $120,200. It didn't take long before a big clash saw "Deltoid" eliminated in 10th place. He held a strong but found himself all-in preflop against the of player "Rims". The board bricked and the aces of "Rims" held up. Next to go was "roffson" who raised pre-flop with and was called by "THEDARKL0RD" who held the versatile hand of . The money went all in on the flop of with "roffson" holding the lead with two pair, and "THEDARKL0RD" with straight and flush possibilities. The on the turn brought even more draws, and a on the river made the flush to eliminate "roffson". "DeadParrot9" was the next eliminated with a slow play gone terrible wrong. Holding on a flop of , "DeadParrot9" held a commanding lead with his two pair against "Rims" who held for just a pair of kings and a gutshot straight draw. However after raising pre-flop "DeadParrot9", only bet the minimum amount on the flop allowing "Rims" to draw cheaply. When the miracle came on the turn, "Rims" had made his straight and a brick on the river sent "DeadParrot9" home in 8th place. "fishbuster1" was next to go after raising pre-flop with , found himself pot-committed to call the check-raise of "bakircioglu" on the flop of . "bakircioglu" held two pair with and it was enough to hold on to win the pot. A short stacked "Flyingdagger" had been laying low as the others fell, and was looking good for a triple-up holding against two opponents. Things improved further for the short stack when "THEDARKL0RD" bet the flop with just an open-ended straight draw to drive "bakircioglu" out of the pot, however he was able to make his straight on the river to end the survival of an unlucky "Flyingdagger". However the luck of "THEDARKL0RD" then started to slide as several large pots went against him. Eventually he found himself all-in with trips holding on a flop of . He was looking good until "bakircioglu" turned over to show a full house and end the tournament of "THEDARKL0RD" in 5th place. With 4 players left "AmichaiKK" had assumed a large lead, but it was the two short stacks that collided next. "bakircioglu" holding found himself trailing the aces of "Rims" with but when the board came , it was the lone deuce of the hand of "bakircioglu" which made trips to end the run of "Rims" in 4th place. "bakircioglu" couldn't continue his run and found himself desperately short and all-in with the mediocre . Both opponents called and appeared set to check it down on a board of , until "LuckyPlayCoolie" made a bet on the river holding a full house with . This was too good for "bakircioglu", who had played very well to finish in 3rd place. Chip stacks were relatively even at the start of the heads-up contest and it was quite a battle until "LuckyPlayCoolie" was able to open a 2:1 lead over "AmichaiKK". The final clash came on a board of with "AmichaiKK" holding for a pair of aces, but was in desperate trouble against the set of "LuckyPlayCoolie" who showed . "AmichaiKK" was unable to hit a miracle ace and was eliminated in 2nd place, leaving "LuckyPlayCoolie" as the tournament and ECOOP bracelet winner!